Pitcher Juan Antonio Marichal, who played in Major League Baseball (MLB) for the San Francisco (California) Giants from 1960 to 1973, was first Dominican-born baseball player inducted into the Baseball Hall of Fame. Marichal, nicknamed “The Dominican Dandy,” was born on October 20, 1937 in Laguna Verde, Dominican Republic. 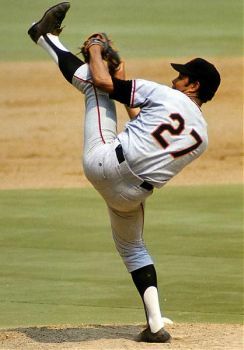 Marichal was most known for his pitching windup, which consisted of a high left leg kick which nearly went vertical to his body, primarily to conceal his pitch until it was thrown. Marichal quit high school in the 11th grade and signed a professional contract with the Escogido Leones, a local team in the Dominican Republic. He was then discovered by Ramfis Trujillo, sponsor of the Dominican Air Force baseball team, where Marichal was immediately enlisted. When he was 21 years old, he signed a contract in MLB with the San Francisco Giants, and made his pitching debut on July 19, 1960. In his MLB debut, he faced the Philadelphia (Pennsylvania) Phillies, where he only gave up one hit in the entire game and won 2-0. Marichal became a major threat on the pitcher’s mound, recording six 20 win seasons 1963-1966, 1968-1969 in his career. Also, during the 1960s, he recorded 191 wins, the most by any pitcher in the National League. Marichal was selected in nine All-Star games (1962-1969, 1971) and pitched in eight of those games. He was awarded the MLB All-Star game Most Valuable Player (MVP) award in 1965. Marichal’s greatest game was on June 15, 1963 when he pitched a no-hitter against the Houston Colt .45’s at Candlestick Park. In 1965, Marichal had an altercation with Los Angeles Dodgers catcher John Roseboro, where Marichal swung a baseball bat at Roseboro’s head. Marichal was fined and suspended, but Dodgers fans never forgave him for the rest of his career. Marichal never received the Cy Young Award, primarily because Hall of Fame pitcher Sandy Koufax received the award multiple times. Marichal’s career statistics are a 243-142 record, a 2.89 Earned Run Average (ERA), and 2,303 strikeouts. He was inducted into the Baseball Hall of Fame in 1983. Soon afterwards the San Francisco Giants retired his number 27 jersey. Juan Marichal currently lives in Santo Domingo, Dominican Republic where he is the Minister of Sports for the Dominican Government. Jonah Winter, Béisbol! : Latino Baseball Pioneers and Legends (New York: Lee and Low Books, 2001); http://www.baseballlibrary.com/ballplayers/player.php?name=Juan_Marichal_1937.